Before the 'Sunken Gardens' came into being in 1972, St Paul's occupied the space. The methodist church closed in 1933 and according to cadastre records was transferred to the States in 1938. The church was latterly used by the States Insurance Authority until 1971, where it moved to Lefevbre street - the church was demolished soon after due to being unsafe. It is believed the church was built on the site of the Saumarez family town house that was demolished in 1860; It is not known when the church was built, but it was in existence on the James Duquemin 'Plan of the Town and Parish of St Peter Port' of 1873. 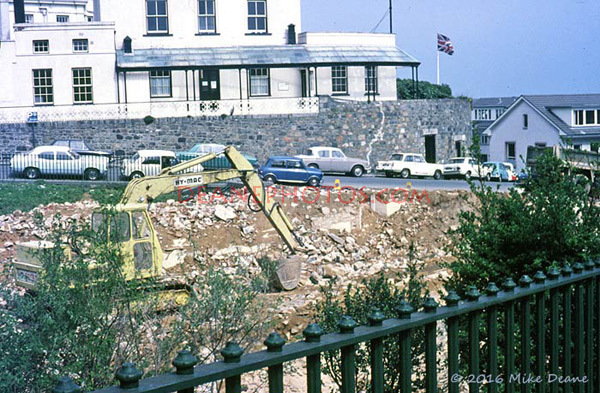 The colour images shown here just prior and during the demolition were taken by myself (Mike Deane); I cannot remember the exact date of St Paul's demolition whether it was in 1972 or a year earlier but I was there taking a few photos just prior to and during the works.